The United Nations’ cultural body has cancelled a Jewish exhibit following Arab pressure, the European Jewish Press (EJP) reported on Friday. The exhibition, entitled “People, Book, Land – The 3,500 Year Relationship of the Jewish People and the Land of Israel”, was co-organized by UNESCO, the UN body for education, science and culture, and the Simon Wiesenthal Center. The exhibit was scheduled to open next Tuesday at the UNESCO headquarters in Paris. It was pulled after a group of Arab states, as well as the Palestinian Authority (PA), said they found it “deeply disturbing,” reported The Jewish Chronicle. UNESCO director-general Irina Bokova told the Simon Wiesenthal Center that the decision arose out of UNESCO’s support for peace talks between Israel and the Palestinian Authority. She said, “We have a responsibility in ensuring that current efforts in this regard are not endangered,” according to The Jewish Chronicle. EJP said that in a letter to Bokova, the President of the Arab group within UNESCO expressed “deep worry and great disapproval” over the program showing the age old connection between Israel and the Jewish people. “The subject of this exhibition is highly political though the appearance of the title seems to be trivial. Most serious is the defense of this theme which is one of the reasons used by the opponents of peace within Israel,” he wrote. “For all these reasons, for the major worry not to damage UNESCO in its… mission of support for peace, the Arab group within UNESCO is asking you to make the decision to cancel this exhibition,” the letter said, according to EJP. The Simon Wiesenthal Center’s director of international affairs, Shimon Samuels, said that the center was outraged by the move. He called for an email campaign to protest against the cancellation, according to The Jewish Chronicle. The World Jewish Congress also denounced the cancellation. In a statement, its president, Ronald S Lauder, said, “This cancellation of a long-planned exhibit is an outrageous political manipulation of a cultural event”. 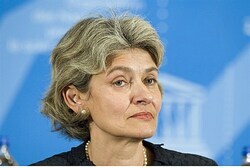 “Sadly, Bokova’s decision to sacrifice education, science and culture to backroom political pressure is routine at UNESCO when it comes to Israel,” added Neuer. “Since 2009, UN Watch has counted no less than 46 UNESCO resolutions against Israel, one on Syria, and zero on Iran, North Korea, Sudan or any other country in the world,” he noted. “This malicious treatment is especially tragic because UNESCO was founded after World War II with the express purpose of combating the doctrine of the inequality of men and races, Today it as sadly become a serial perpetrator of inequality,” concluded Neuer. The latest move is certainly not the first time that UNESCO has reached anti-Israel decisions. In a controversial decision, UNESCO accepted the PA as a member in October of 2011, after 107 members voted in favor of the motion. Only 14 nations voted against the PA, including the United States, Canada, Germany and Israel. The move prompted the United States to cut off funding to the organization, due to a longstanding law that prohibits U.S. support for any United Nations-affiliated body that accepts Palestinian Authority membership. After admitting “Palestine” as a member, UNESCO designated Bethlehem’s Church of the Nativity and the nearby pilgrimage route as a World Heritage site. After it succeeded in getting the Church of the Nativity recognized as a World Heritage Site, the PA had announced it would seek to have additional religious sites recognized by UNESCO. Most recently, a UNESCO “monitoring visit” to the Old City of Jerusalem was called off by Israel after it was discovered that the PA was were trying to “politicize” it contrary to understandings reached by the sides, and to change the action plan UNESCO decided upon in 2010. The UN group claimed it wanted to visit Jerusalem to catalog the sites, and that the trip was to be professional in nature – and that it would not have a political character. On that basis, the government agreed to allow the group into Israel. In reality, however, UNESCO officials had set up several meetings with Arab activists, Palestinian Authority figures, and terrorists, giving the visit a political, not professional, character.